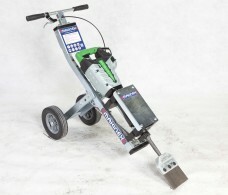 SmartMixx™ is the ultimate mixing station for all self-levelling cement, producing a perfect mix every time. Designed by contractors for contractors it provides efficient hands-free mixing and fast precision pouring of materials, saving valuable time on jobs. One SmartMixx™ station can mix up to 80kg in 3 minutes, which equates to 1 tonne per hour. The trolley unit is ultra-lightweight for easy transportation and the ergonomic design with easy tilt operation provides control and speed for precision pouring. SmartMixx™ also features a dust/splash reduction cover for safer use and less mess. 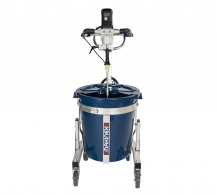 SmartMixx™ has been tested, approved and is recommended by Dr Rolf Offerhaus, ARDEX Australia, as the most efficient mixing station for levelling compounds. 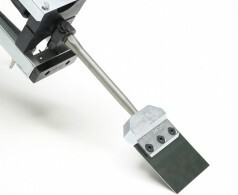 SmartMixx™ is sold with an optional Protool® Stirrer. 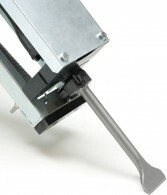 The Protool® Stirrer features variable speed sand is fully detachable. SmartMixx™ can be used with a selection of other brand stirrers (please contact Work Smart Equipment for more information). 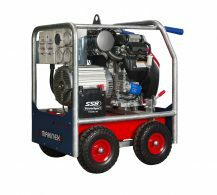 The NEW Hose 2 Go – A constant pressure water supply unit ideal for the Hire and Rental Industry as a dust suppression tool and portable water supply. The Hose 2 Go has a constant flow of water that allows you to supress the dust when cutting, core drilling and grinding concrete. It’s different to every other product on the market because it provides a constant water flow without the use of a pump, battery or electronics. An easy to use dust suppression tool and portable water supply, which has a handle with two easy carrying positions. 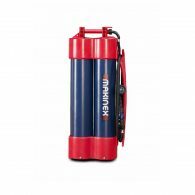 The Hose 2 Go is Australian designed and has been in development for 4 years, Makinex feel this is the most innovative product to hit the Hire and Rental Industry for a long time. Machined out of a solid block of tool-grade steel, the Tile Smasher suits most jackhammer types and is built to last. The tool includes a durable 2mm thick high tensile steel blade held together with high tensile fine thread bolts and high grade Loctite thread lock. Countersunk bolts eliminate the risk of the bolts sheering off as found in other models. The tool comes fully assembled and lifts up tiles, vinyl and cork. It can also be used for cleaning tile beds. Known in the industry as a certified “Tile Lifter”, this sturdy tool comes with a 6 month guarantee. Replacement blades are also available. Suitable for the popular Hitachi Hammer, this strength hardened steel chisel has a demolition head suitable for most materials. This one-stop jackhammer tool has been used in endless situations and will outlast and outperform other chisels with its unique flippable design which keeps an ever-sharp tip. This understated tool improves efficiency and extends the chisel’s life over other chisels on the market. The Easy Hammer jackhammer trolley is an innovative demolition tool for the fast and easy removal of floor tiles, vinyl and cork from concrete and wooden surfaces. It can also be used to remove residue from tile beds and for breaking rocks, blocks, concrete and sandstone. Easy Hammer quickly removes floor tiles with some customers claiming they can do their demolition job up to 6 times faster than when using a jackhammer alone. No more struggling or bending trying to handle heavy jackhammers! The Easy Hammer carries most of the weight of the jackhammer while the user positions themselves behind the trolley and pushes it along. The ergonomic design reduces vibration impact to the user. Easy Hammer can be adjusted to 6 different positions ranging from 20-80 degrees to suit most demolition jobs. Easy Hammer makes using a jackhammer and your demolition job easier, faster and safer. The Makinex Floor Stripper is a heavy-duty industrial machine designed to remove materials such as vinyl, glued carpet and cork from floors. It is ideal machine for contractors, hire & rental companies, and renovators with its easy tool-free setup, quiet operation and minimal maintenance. 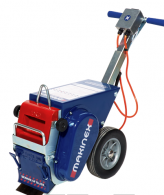 The Makinex Floor Stripper sets it apart from the competition with it’s quality and reliability. With many units already built and sold in Australia and overseas, the Makinex Floor Stripper is the outcome of experienced design, rigorous testing and quality components. The Makinex Powered Hand Truck PHT-140, previously known as the OneLIFT, is a universal materials handling solution that enables one person operation to safely lift and load small equipment or bulky goods weighing up to 140kg (309lbs). It provides a quick and easy alternative to using a forklift or tailgate loader for small loads. The Makinex Powered Hand Truck has many applications and can be used in workshops, warehouses, factories, depots, distribution companies, and hire and rental yards. The Makinex Powered Hand Truck features powered lift via a 12V 25 Amp linear actuator. It is easy to operate – the lifting arm reach is controlled by the user lifting or lowering the handles and arm height is controlled via a simple thumb switch. The unique design enables one person operation to lift and load directly into vehicles (trucks, vans, utes and cars) or to place equipment and small loads on bench tops. It eliminates awkward and dangerous one or two person lifts and reduces the incidence of back and other injuries caused by heavy lifting. The Makinex Powered Hand Truck is lightweight and easy to manoeuvre. After use it can be folded down flat for easy transport and storage. 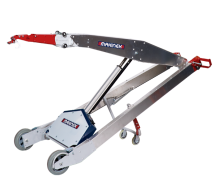 The Makinex Powered Hand Truck comes standard with a Hook attachment for lifting, moving and loading small equipment and machinery fitted with a lifting eye, e.g. 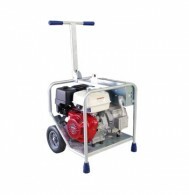 water pumps, generators, air compressors, plate compactors etc. A Fork attachment for lifting, moving and loading small pallets and skids is optional and sold separately. 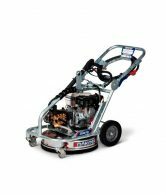 The Makinex Dual Pressure Washer combines a rotary cleaner and wand pressure washer in the one machine, with the ease of swapping between them at the turn of a handle. The water pressure is fully adjustable. The versatility of the Makinex Dual Pressure Washer is unparalleled. The dual washer functions and adjustable pressure make it perfect for an extensive list of external cleaning applications such as: car parks, driveways, paths, pavements, tennis courts, sports grounds, decks, machinery and more. The Makinex Dual Pressure Washer features a Honda engine and a 10m hose to access hard to reach places. Other features include rubber mounts to reduce vibration from the engine, brake castors, heavy duty geared pump with thermal release valve, lifting eye and foldable handle to assist transportation. 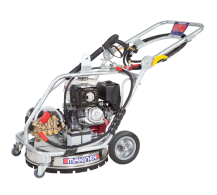 The Makinex Dual Pressure Washer combines a rotary cleaner and wand pressure washer in the one machine, with the ease of swapping between them at the turn of a handle. 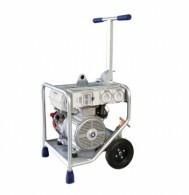 The water pressure is fully adjustable from 1000PSI up to 4000PSI. The Makinex Generator Range is a robust, powerful and reliable solution for providing power to equipment and tools, floor grinding, welders and brick saws., air compressors and a wide range of applications. Our permanent magnet alternator technology reduces the cost of ownership.